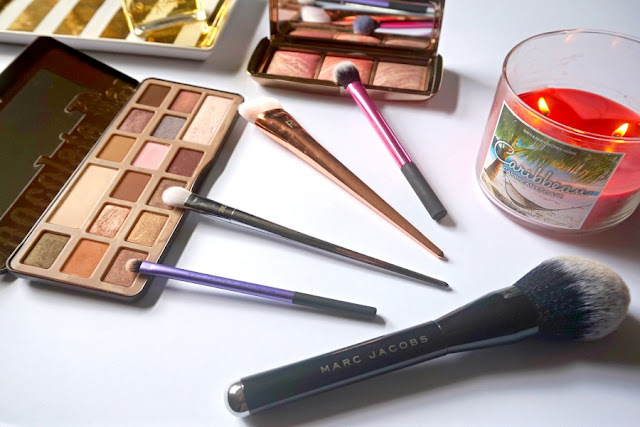 It's easy to fall in love with the newest and most hyped up products, but there are some products that have been out for years and are still loved and raved about. No matter what trends are in at the moment, these products are ALWAYS in style to me. The Bioderma Sensibio Micelle Solution* is a skincare game changer!!! I wish I knew about this when I was in my early 20s! It would have meant that I never would have gone to bed with make up on. I love that I can use this to remove my make up without having to use water. I always keep a bottle in my bathroom for those nights when I just want to get to sleep. There are a lot of thermal spring waters on the market. I've been using them off and on since I was a teenager. I love to use them as a toner, a make up setting spray and I also apply them after hair removal to reduce any redness. I've tried a lot, but my favourite is the Uriage Thermal Water. I'm currently on my 4th bottle. 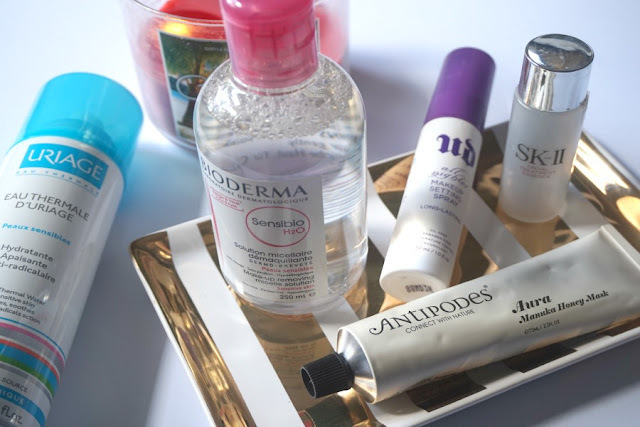 Antipodes is a bloggers favourite. They're a natural brand from New Zealand that gives you great results with a side of luxury. They have some amazing products but the one that I ALWAYS see raved about is the Aura Manuka Honey Mask. If you've never tried it, go pick it up tomorrow!! Setting sprays are a must for anyone looking at keeping their make up in place all day. There are a lot around but the Urban Decay All Nighter Makeup Setting Spray is the one that I always see people recommend. It's also perfect to use if you've used too much powder products as it helps to stop it looking dry and cakey. An amazing Aussie product that everyone needs to try is the Lanolips lip balms. They have some amazing scents (pear and peach are my favourite ones) that are hydrating and last longer than most lip balms. I've purchased so many that I've lost count. The Lemonaid Lip Aid is amazing because it has a gorgeous shine and the lemon oil also helps to exfoliate your lips softly. The Nuxe Huile Prodigieuse Multi Purpose Dry Oil is an oil you can use on your face, hair and body that will help to hydrate and moisturise you from head to toe. Even though it's an oil, it doesn't make you feel oily. It also has a gorgeous and sophisticated scent that was so popular that they released a perfume of the scent. While essences are starting to gain popularity here in Australia, there's been one on the market that has been raved about for years. 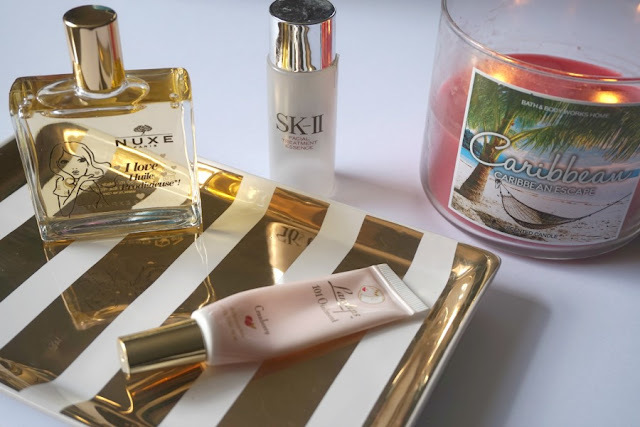 The SK II Facial Treatment Essence lives up to the hype. I found that it wasn't until I stopped using it that I really noticed how much of a difference it made to my skin. It gives me clearer, brighter and more glowier skin. While it's pricey, it's worth every cent. It's a cliche to have a candle burning in the background of a youTube video, but after you've used a Bath And Body Works candle you'll know why everyone raves about them. The 3 wick candles are HUGE. They burn for weeks and they have the most amazing scents. They're also quite affordable. Highlighters have really exploded in popularity over the last 2 years, but the Becca Shimmering Skin Perfector highlighter has been a cult favourite for many years. They have both a powder and liquid formula but I prefer the pressed version as it's quicker and easier to use. I really like "Moonstone" as it works best for my pale skin. A lot of people would say the Urban Decay Naked Palettes are a cult favourite, but personally I think they're overrated. I prefer the Too Faced Chocolate Bar Palette. While it has a lot of easy to wear neutral colours, there's also a gorgeous golden olive colour and a sparkly purple. It has a great mix of mattes and shimmers that work for all different skintones. 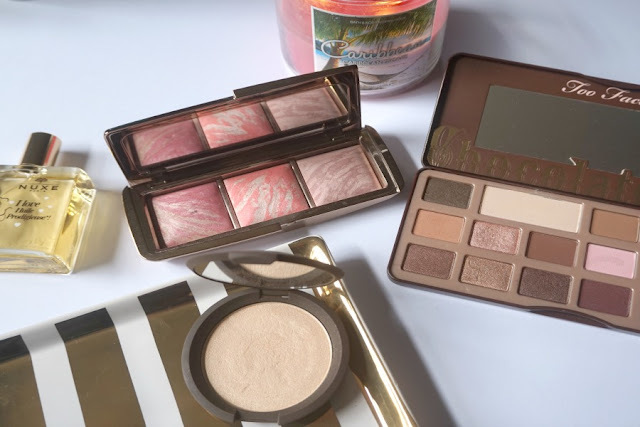 Trying to find a blush that looks radiant without being glittery or shiny can be hard, but Hourglass caused a stir when they released their Ambient Lighting Blushes. The blushes are extremely pigmented but they never look cakey. I bought the Christmas palette and I adore it! Real Techniques were a breath of fresh air when they were first released. There was a gap in the market for affordable but great quality brushes. Every blogger and youTuber owns at least one RT brush. I love that they've released the Bold Metals range which are more glamorous and look gorgeous displayed in my brush holder. While the Marc Jacobs Bronzer Brush has a hefty price tag, it's worth every cent. It has a gorgeous tulip shape that makes it perfect for applying highlighter and contour as well as powder and bronzer. I adore this so much that I could happily purchase another one. One of the most hyped products of the last decade has been the ghd hair straightener. I first purchased one about 10 years ago. It was one of the pink ones that they released as apart of their National Breast Cancer campaign. It was at that stage my most expensive purchase item and I adored it! 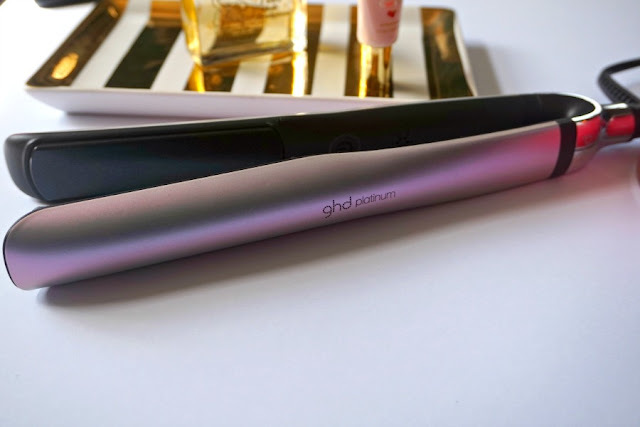 I now have the ghd Platinum Serene Pearl Styler* and it's incredible. It has curved sides which make it perfect for creating curls. I also adore the "ding" it makes when it has heated up and it's ready to use. This comes with a heat resistant mat which is perfect for when I'm busy in the morning. I can put it on the mat to cool down and not worry about melting or setting anything on fire. Even though I love this so much, I'm lusting after the Christmas edition as it's copper!!! It's so pretty!! How many of these have you tried? Is there any cult products that you would add to the list? I LOVE my Lanolips lip balms! I use the normal 101 Ointment + 2 of the tinted SPF balms & adore them. I've tried the Nuxe body oil, but I personally think it's overrated & did nothing for my skin except make it feel drier funnily enough. 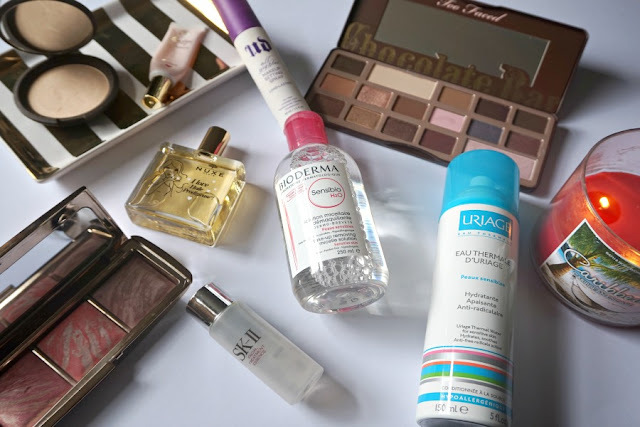 I've tried micellar water & thermal spring waters, but from different brands. I think a number of people end up starting out with Real Techniques brushes these days - they are relatively affordable.